Phuket Opinion: A vote for everything, or a vote for nothing? PHUKET: Today (Mar 24), Thailand is holding its first genuine national election for seven years. For many young voters, it will be their first. Voter turnout is expected to be high, as it seems everyone young and old has an opinion to express through their ballots. If it’s any indication, according to the Election Commission in Bangkok about 2.6 million people registered for the advance voting held across the country last Sunday (Mar 17) with a national average of nearly 87% turning out to cast their votes, and turnout in several areas exceeding 90%. Anywhere in that region of turnout would be a far cry from the 54.75% of eligible voters in Phuket who cast their votes last year in the national referendum for the current Constitution. Last weekend, Phuket had the highest number in the South for those living and working on the island casting their votes for candidates in their home provinces elsewhere in Southern Thailand in a clear statement that they want their voices to be heard. 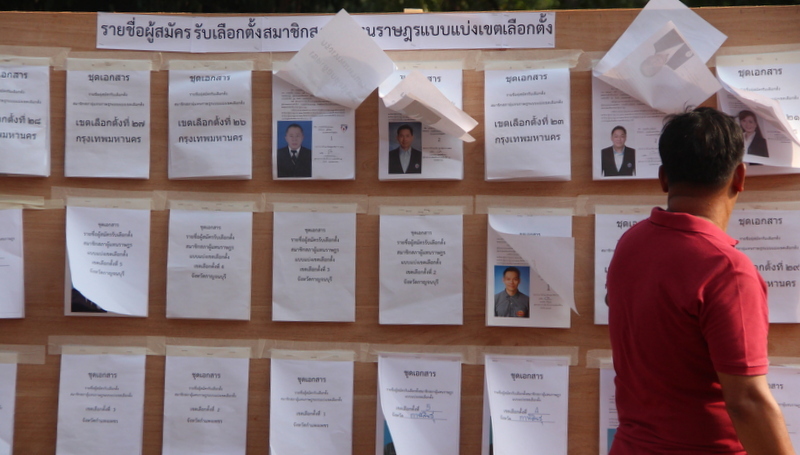 However, with elections held so far in the past, many young – and now even not so young – voters may well have forgotten that seats won in the 14 provinces of Southern Thailand count for virtually nothing. Yingluck Shinawatra’s “landslide victory” in 2011 saw her Pheu Thai Party win not a single seat of the 53 seats available in the South. Thaksin himself fared no better. In 2005 his Thai Rak Thai Party won just one seat, but that was better than in 2001, when his rise to power through Thai Rak Thai saw his party win no seats at all in the South. Getting the picture? In political terms, as long as the money keeps rolling in and “loss of face” incidents aren’t too embarrassing – like a massacre of more than 80 unarmed civilians by the Army in the southern border town of Tak Bai – then Bangkok politicians literally don’t have to care about voters in the South at all. There is a lot to not like about the past four years, but the coup did bring the one thing it was essentially aimed at achieving: the country has been "stable" under the Army. Those worried about the election’s effect on the economy might be able to breathe a little easier when they look back and remember CentralWorld on fire and M79 ‘bloop gun’ grenade launchers sounding off amid protests on the streets of Bangkok. Those days have not returned. We pray it stays that way. Another thing to remember is that while people were still muttering about the nightly curfew in the days after the 2014 coup, they might want to also remember cache after cache of war weapons seized by the soldiers carrying out raids in Bangkok, Chonburi and Isarn. The shame has gone both ways. However, after all is said and done, regardless of the vote, regardless of the turnout, one way or another the election this weekend is going to count. It is hard to ignore. Change is in the wind. In my day we called it a "bloop gun." Because of the noise it makes it's known by various other nicknames such "thumper", "thump gun," "bloop tube." Whatever you want to call it it's a M79 grenade launcher. It's actually known as a 'Blooper' not a 'bloop gun'.